Responding to attacks on the 19th Amendment, Prime Minister Ranil Wickremesinghe yesterday insisted that the current spate of drug busts were accomplished only because the Police and Judiciary had been made independent under the 19th Amendment that was passed with the support of the United National Party (UNP) in 2015. Speaking in Bulathsinghala yesterday, the Prime Minister pointed out that the Judiciary and Police had been empowered by the Constitutional Council set up after the passage of the 19th Amendment. The appointment of independent commissions allowed the Police and Judiciary to be depoliticised and this created an environment for them to carry out their duties free from any pressure, he said. “The independent commissions have made the Police stronger. The results of this has clearly been seen between 2017 and 2019. During the last two years, a large amount of narcotics was apprehended because the Police could function independently. 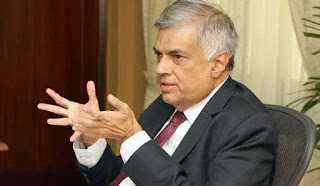 By criticising these independent commissions, efforts are being made to create space for drug smugglers to raise their heads again,” Wickremesinghe said. The Prime Minister said narcotic raids had tripled from February 2018 to February this year, with raids expected to continue. Wickremesinghe also said that the Government had discussions with the United Arab Emirates (UAE) Foreign Minister about Makandura Madush, which led to his eventual arrest in Dubai. “We are now beginning to see the results of these efforts. However, if these actions are to continue and grow, then we must increase the independence of the Police and Judiciary. We have to decide whether to disrupt the drug smuggling industry or to allow it to continue. If we want wrongdoers punished, then the best way is to allow the Police and Judiciary to continue working independently. President Maithripala Sirisena, on several occasions over the last few weeks, openly criticised the Constitutional Council for having rejected his recommendations when giving promotions to judges. In a blistering address to Parliament last week, President Sirisena charged that the 19th Amendment was his “legitimate child” but it had been abused in the way it was being implemented. Opposition Leader Mahinda Rajapaksa had also criticised the 19th Amendment on several occasions since the end of the Constitutional Crisis and argued that the Constitutional Council could not be regarded as independent for as long as it has political members. Speaker Karu Jayasuriya has dismissed the President’s claims that the Constitutional Council was partisan and had provided a detailed explanation as to how judges were selected for promotions in a letter sent to President Sirisena. But, the latter had rejected it and insisted he was kept in the dark as to why judges recommended by him had been rejected.